The Golden Age Of Art School. Award Winning Modular Candlesticks that I made when I was a final year apprentice. Well, I've looking for a place to start with this blog, so going back to the beginning seems like a good idea ! When I was a student at the RMIT University back in the heady days of the early seventies. I was at the time moving from making functional items like my Modular Candle Sticks and Fruit Bowl which I made whilst I was an apprentice silversmith for the ecclesiastical firm Pelligrini and Co in Melbourne and moving into more non utilitarian objects like my Sterling Silver container titled LIPS . These non functional objects where sculptural in nature and a vehicle for exploring personal ideas. I remember fondly in the basement foyer of the School of Gold and Silversmithing Dept. a congregation of cleaning ladies where pointing and giggling at the Lips which where on display in the foyer cabinets . LIPS where one of those pieces that you either liked or had an intense obversion to. 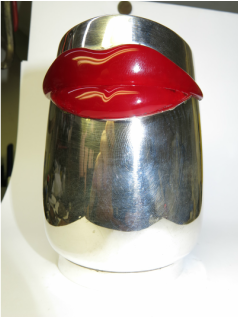 The seductive contemporary swedish shape and the bright red perspex lips gave little away as to what resided inside. I obtained some dentures from the Dental School and set them into the lid of the container and hidden from view. It was only when the lid was opened that the dentures where revealed resulting in fits of laughter or growls of repulsion. These and other items will be on show at the Eltham Retro Show at Eltham Fine Art Gallery. Opening on Sunday the 14th at 2pm and running until the first week in May. Eltham Artists from the 1960s to the1980s at Eltham Fine Art Gallery. Lips. 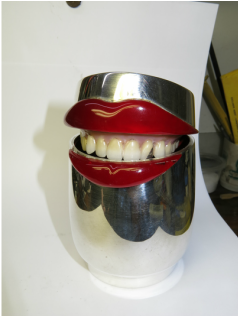 Artist; Will Francis, circa1972 Sterling Silver, Moulded Perspex, Dentures and Polyester Resin.